With summer in full swing, lots of people will be taking advantage of holiday time and good weather to make for the trails and get the most out of optimum hiking conditions. Many will also bring their four-legged companions along for the journey too. While most dogs will certainly relish the opportunity to roam across new environments sniffing out what the landscape has to offer, dog owners need to take into account the needs of their pets to ensure that both dog and owner have a pleasant and safe excursion and plan their ramblings accordingly. Whether you’re a hardened outdoorsman or an occasional hiker, it always pays for man and his best friend to be prepared. First of all, make sure your dog is physically up to the challenge of a long hike. For larger breeds that live in the countryside or get regular and robust walks, this should be an easier proposition. However, if you happen to own a pomeranian bulldog, pug or another short-muzzled dog, then a sustained hike won’t be feasible. Assuming your dog is fit enough to join you, it’s essential to familiarise yourself with ways to treat basic injuries and, even better, learn how some preventative tips to avoid situations where they can get injured in the first place. 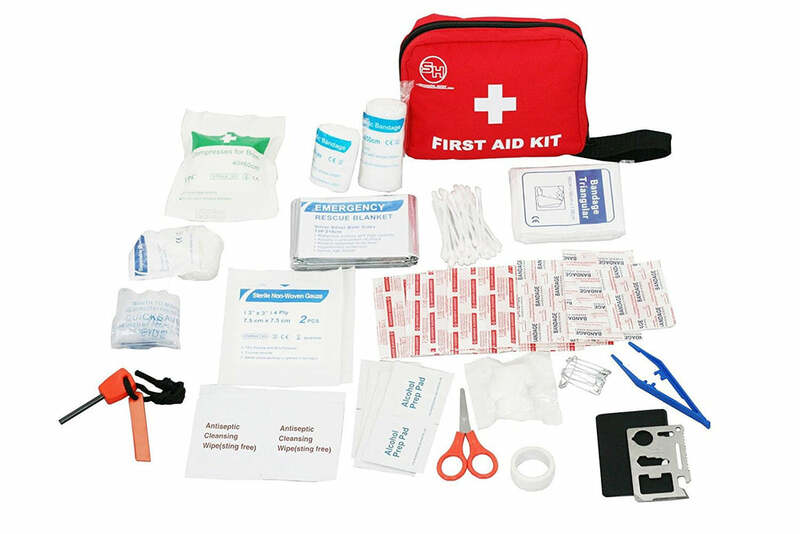 You should be carrying a robust, portable emergency first aid kit in your knapsack or bug-out bag to a hike anyway, with or without a dog. The good news is that a lot of the contents of a well-chosen first aid kit for humans can be used to treat dogs as well, with items like tweezers, bandages, medical tape and gauze pads all of use in the event that your canine companion suffers an injury. A good antiseptic like peroxide or betadine for cleaning wounds and some eye wash could also come in useful. Food and water should be of primary concern when taking a dog for a walk. Stock up on a generous amount of dry food and some protein treats. It’s vital to bring plenty of water, but it’s also important to train your dog to drink from a portable container when on the move. Short water breaks can be more effective than having your dog walk around with a lot of water weight making progress more tiring, but you should still ensure your dog is well hydrated at the very beginning of the walk. The same goes for food as well. Check with your vet if you’re in doubt about suitable provisions to take hiking with your dog. Insect stings/bites: Remove the barb or stinger with tweezers, clean the wound with disinfectant and give the dog an antihistamine if necessary. Ankle or paw strains/ sprains: Slow your hike down, and carry the dog if possible. Don’t attempt to split the damaged limb. Foot cut: disinfect the wound, and if you have foot protection like a dog boot, put that on the injured paw. Ingestion of unknown flora: if your dog has eaten mushrooms, plants or berries and you don’t know what they are; provide the dog with an emetic to induce vomiting. Peroxide or whatever disinfectant you’re carrying can often prove effective in this scenario. Snakebite: seek veterinary attention immediately. Broken bone: much as with humans, a broken bone signals the end of your hike. Carry your dog if possible and head back at a slow pace. Heat stroke/exhaustion: take frequent breaks, stick to the shade and avoid hiking in very high temperatures to prevent this from occurring, especially in the case of long-haired and overweight dogs. If they show signs of exhaustion or overexposure, take a break, water them and wet their feet, coat and face, and end the hike and seek veterinary assistance should they fail to show signs of recovery. Ripped dewclaw: disinfect and bandage the paw while ensuring it’s not so tight as to constrict circulation. Ticks: Consult your vet for preventative tick and flea medication. Common sense and preventative measures can reduce the risk of injury to your dog. Keep your dog on a short leash on a precarious terrain. Watch your dog around water to ensure they don’t get swept away, and ensure they don’t contaminate water sources with their urine. As always, carry doggy bags with you or make sure you bury any waste they produce. By taking the appropriate precautions, it’s possible for you and your dog to have a safe and enjoyable hike together, but remember above all else, not to overtax yourself or your animal.